Museum expansion includes plans to open archive of historic drawings to visitors. The world-famous Tretyakov Gallery in Moscow's Lavrushinsky Lane, where the family of the founder of the museum, Pavel Tretyakov, lived in the 1850s, is expanding. The consultant for the development is Rem Koolhaas, a legend in the world of architecture and a Pritzker Prize winner; the futuristic facades of the new building have been designed by the SPEECH bureau and its head Sergei Tchoban, the founder of the Berlin Museum of Architectural Drawing. The new building, due to open in 2020, will primarily house the Tretyakov Gallery's collection of drawings. It will include storage space and a graphic art study hall. Because of their fragility and sensitivity to light sources, the Tretyakov's drawings have long been largely hidden from view but under the plans will be made available. Tretyakov Gallery director Zelfira Tregulova, in an interview with RBTH, said she was inspired by the example of the Study Hall at the Albertina museum in Vienna, the database of which contains some 600,000 exhibits which can be viewed on computer terminals within minutes of being selected. While it is not possible to replicate this in Moscow, Tregulova is convinced that free access to drawings, engravings and watercolours should be given to everyone: "By appointment, access here will be granted to everyone, not just art historians. It will require extra effort, but this is an important part of our work that must be done." The founder of the gallery, Pavel Tretyakov, started collecting drawings, watercolors and engravings at the same time as paintings. After the Bolshevik Revolution, the collection received additional items from other museums and sources and now has more than 30,000 works dating between the 18th and 20th centuries. The collection includes material from the classics - such as Karl Bryullov's spectacular riders and Alexander Ivanov's "Biblical sketches" - to Russian avant-garde and innovative graphic art from the world of theater, including sketches of Sergei Diaghilev's Ballets Russes by Leon Bakst, works by Alexandre Benois and Nicholas Roerich, and drawings for the legendary futurist opera "Victory over the Sun" staged by Kazimir Malevich. Apart from new services and a multi-functional hall, the new building will have a large space for full-scale exhibitions. The new building, in Moscow's atmospheric old merchant district of Zamoskvorechye, is expected to be finished by 2019 and open to visitors in 2020. The next extension will differ from the the main Tretyakov Gallery, which resembles an Old Rus palace. The new building resembles a ship facing the Kremlin. It will become a kind of a front entrance to the historical complex, which is based around Tretyakov's house with numerous outbuildings for various collections that originally housed large and small paintings hung so close to each other that they completely covered the walls. Architects from SPEECH reflect this image of what is known as "salon-style display" in the way they have arranged the windows on the facades of the new building. 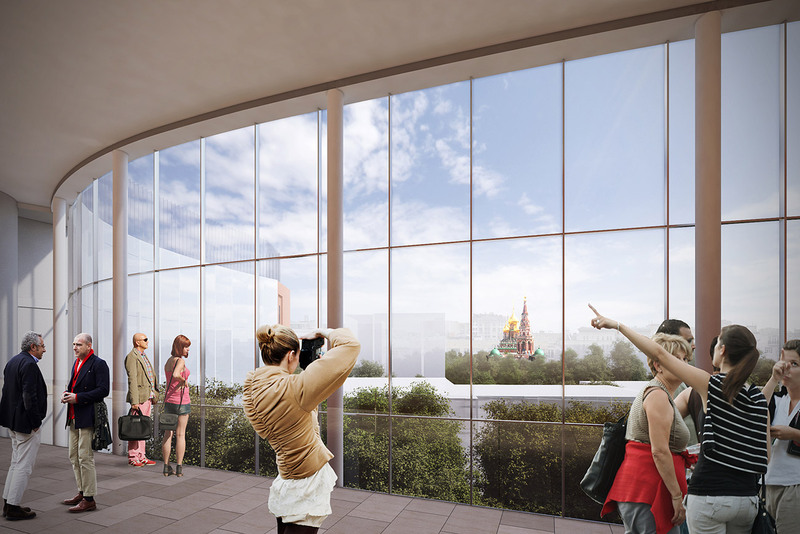 The new extension's plans envisage a building connected to the main exhibition halls by a gallery where visitors can look at displays or have lunch in a restaurant with breathtaking views of the Kremlin. "This building is very important to us since a lot of attention is being paid to infrastructure, which is practically absent in our main historic building in Lavrushinsky Lane. It should enable people to get to the museum quickly and take advantage of all the amenities," Tregulova added.